Simply click on one of the tabs above and JIT will provide you with Product Samples and/or Product Catalogs that are "Free of Charge." 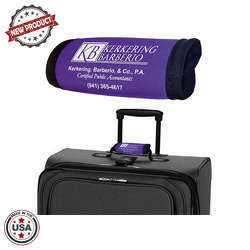 Size: Works with small to medium sized suitcases, handbags and luggage. Order Info: Prices include 1-color puff imprint on one side. Additional Imprint Colors: Add $0.15(v) each, maximum 4 imprint colors. 250 piece minimum for multi-color orders. Ink Changes: Ink changes within a purchase order run $15.00(v). 250 piece minimum for ink changes. Copy Changes: Not permitted; a separate PO should be submitted for each copy. PMS Color Matching: $25.00(v) per color, please click here for our PMS Match policy. Screen: $30.00(g) per color. Repeat Screen: $30.00(g) per color. 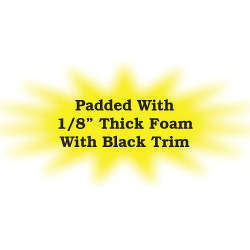 Imprint Area: 1 1/2" H x 2 5/8" W.
Case Pack: .25 pieces, 8x8x8, 2 lbs. ...............50 pieces, 8x8x8, 3 lbs. ...............75 pieces, 8x8x8, 3 lbs. ..............100 pieces, 14x10x8, 4 lbs. ..............160 pieces, 14x10x8, 6 lbs. ..............200 pieces, 18x12x9, 7 lbs. ..............250 pieces, 18x12x9, 9 lbs. ..............300 pieces, 20x14x10, 11 lbs. ..............400 pieces, 20x14x10, 15 lbs. ..............450 pieces, 22x17x12, 17 lbs. ..............600 pieces, 22x17x12, 22 lbs. Production Time: Normally 7-9 business days. Peak Season (June-September) can reach 10-12 business days. 1 Due to computer monitor differences such as viewing environment and monitor settings, all color swatches are approximations. 2 PMS # references are approximations. 3 Product colors DO VARY from dye lot to dye lot, which may affect product color from order to order, or within an order. 4 Camouflage patterns are random and variable. 5 Due to the contrasting colors within each camo pattern your logo may not be legible in all areas and camo patterns may show through lighter shades of ink colors in areas where the camo is darkest.